Deciduous shrub or tree, up to 25 m tall; axillary buds with stalks; bark scaly, often lichen-covered, yellowish-brown or grey-splotched with white. Alternate, deciduous, smooth, coarsely to irregularly toothed, the teeth pointing outwards, leaf margins rolled under, brownish in the fall. Inflorescence of male and female catkins which open before the leaves enlarge; male catkins with stalks. Small nutlets, with narrow-winged margins; female cones 1.5-2.5 cm long, egg-shaped. Moist woodlands, forests, floodplains and clearcuts in the lowland and montane zones; common in coastal BC; N to SE AK and S to CA. 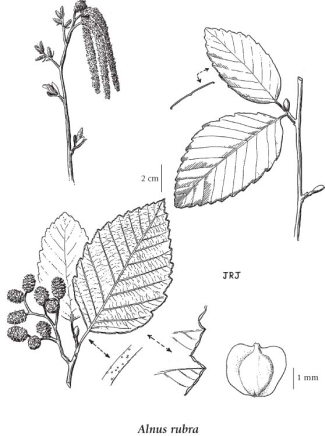 Red alder is probably the most common deciduous tree in the southern part of British Columbia. The leaves normally have shallow, rounded teeth along their margins. 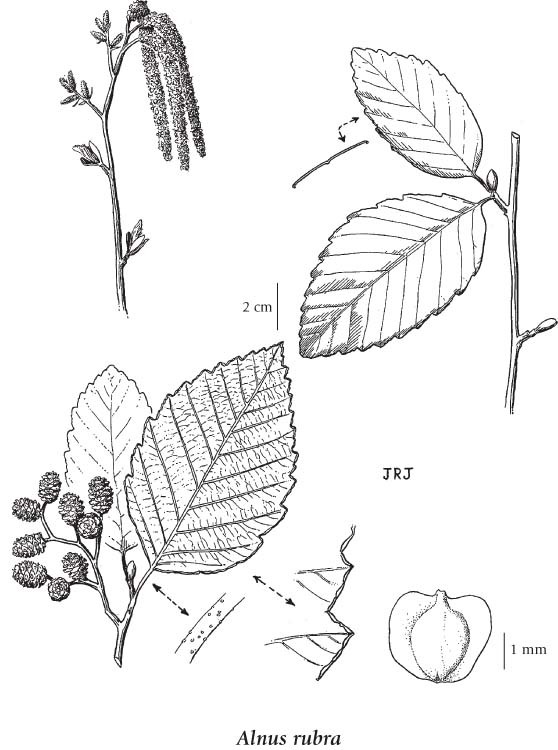 The leaves of the cut-leaf mutant form have irregular, sharply pointed teeth and lobes, thus resembling some black oak leaves more than alder leaves. Source: Extracted with permission from Griffiths and Ganders, 1983. This species flowers in the first week in March in the Fraser Delta. A shade-intolerant, sub montane to montane, Pacific North American deciduous broad­leaved tree. An abundant species that grows in cool mesothermal climates on nitrogen-rich soils (Moder and Mull humus forms); its occurrence decreases with increasing elevation and continentality. Forms dense stands in the initial stages of primary succession on floodplains or secondary succession on water­shedding sites. Persists along streams and on water-collecting sites, usually associated with Lysichitum americanum; tolerates fluctuating groundwater tables. This fast -growing tree regenerates abundantly from seed on exposed mineral soil and from stump sprouts following cutting. May hinder regeneration and growth of conifers. Symbiosis with nitrogen­fixing Actinomycetes enhances the supply of available soil nitrogen. Suitable as a temporary nurse species for shade-tolerant conifers, especially on nitrogen-deficient sites; however, it may decrease both soil pH and base content of some soils. Characteristic of young­seral mesothermal forests. Griffiths, Anthony J. F. and Fred R. Ganders. 1983. Wildflower Genetics: A Field Guide for British Columbia and the Pacific Northwest. Flight Press, Vancouver.